I love rustic food and this is one of my favourites. I like to serve it with either mashed potatoes or pasta but my favourite is krithiraki (Greek version of Orzo). I made this the other night for my Brother and Sister-in-law. It is so easy to make and you can prepare well in advance and warm up when you are ready so ideal for entertaining. Cacciatore means “hunter” in Italian. In cuisine, alla cacciatora refers to a meal prepared “hunter-style” with onions, herbs, usually tomatoes, often bell peppers, and sometimes wine. The dish is originally from Central Italy, but like so much Italian cuisine, every region has put its own twist on the recipe. This one, with tomatoes, is probably the most widely travelled. Heat half the oil in a large pan or casserole. Add the onion, garlic and celery and fry over a moderate heat for 10 minutes until golden and softened. Stir occasionally to prevent sticking and burning. Add the pancetta and mushrooms. Increase the heat and cook, stirring occasionally, for 10 minutes until starting to brown. Remove and set aside. Add the rest of the oil and fry the chicken in batches over a high heat to brown all over. Season as you go with salt and freshly ground black pepper. Spoon off any excess fat then add the wine and cook until the liquid has almost evaporated. 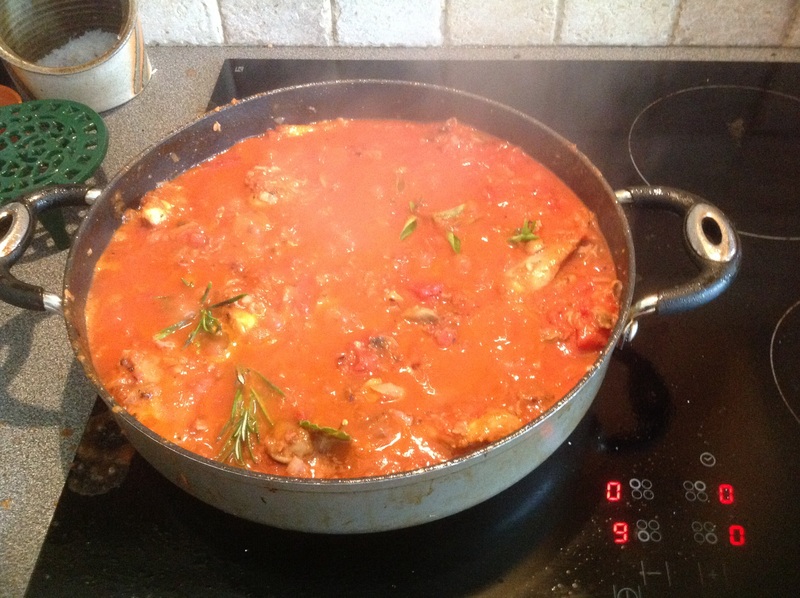 Add the tomatoes, sugar and herbs with 125 ml of cold water. Bring to the boil the stir in the reserved pancetta mix. Cover and simmer for 30 minutes or until the chicken is tender but remains on the bone. If you like a thicker sauce, remove the chicken pieces and keep warm then boil the sauce until thickened. Season to taste. return the chicken to the sauce and heat thoroughly then serve with pasta or mashed potato.